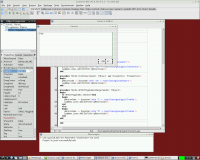 Lazarus is a cross-platform IDE for Free Pascal, a professional 32 bit / 64 bit Pascal Compiler. It supports a wide variety of processors and Linux distributions including the Raspberry Pi. This page was last edited on 8 September 2013, at 14:32.